The council decides to hire a facilitator to help resolve the conflict over maintaining waterfront access in the Shore Acres neighborhood. Cape Elizabeth residents line up to speak Monday night as the Town Council hears testimony on whether to vacate or accept paper streets along two shoreline areas that are used by the public. 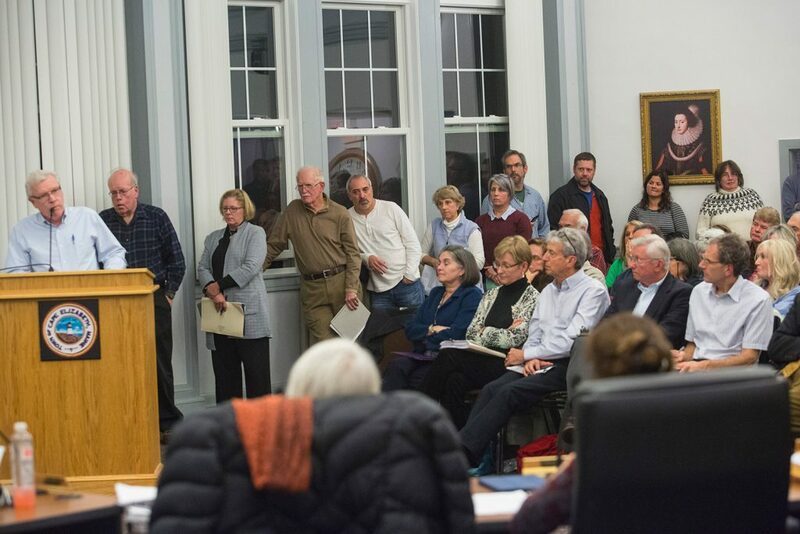 CAPE ELIZABETH — Town councilors struggled to find a resolution Monday night to the dispute over so-called paper streets that run between the waterfront and several multimillion-dollar homes in the Shore Acres neighborhood. The council was scheduled to either vacate, accept or extend the town’s right to accept Surf Side Avenue and Atlantic Place, two paper streets that appeared on a 1911 subdivision plan but were never built or completed. Councilors wrangled over several other options, such as holding a non-binding referendum to gauge community sentiment and seeking an easement before vacating the 2,000-foot strip of waterfront where some townspeople would like to hike. 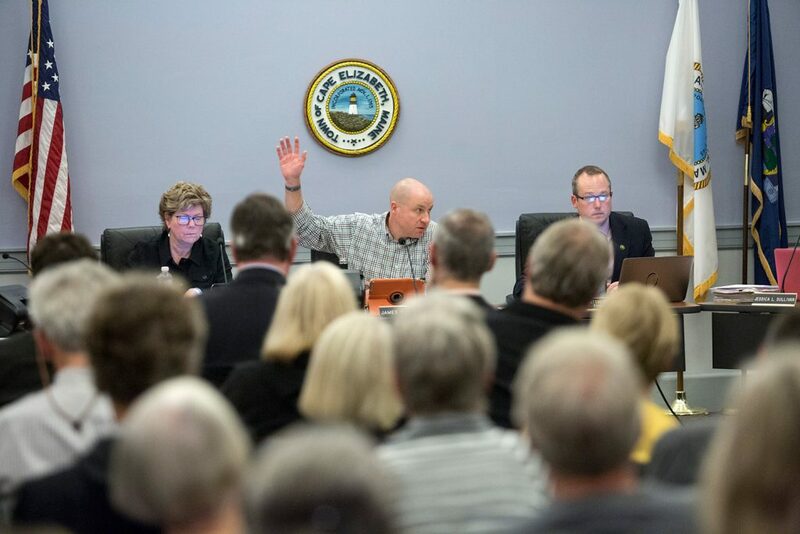 Finally, around 11:30 p.m., the council unanimously decided to extend the town’s right to accept the two paper streets, and to hold a series of professionally facilitated forums where neighbors and other Cape Elizabeth residents might negotiate a solution. Councilors Sara Lennon and Caitlyn Jordan initially questioned the legality, potential effectiveness and cost of the mediated forums but ultimately supported this idea. The council decided one year ago to extend the town’s right to accept the paper streets for an additional 20 years. Durward Parkinson, an attorney for the town, has said a decision to either accept or vacate the right could embroil the town in costly and protracted lawsuits. The council also voted 4-3 Monday night against vacating the a paper street at Lighthouse Point Road, near the popular Lobster Shack at Two Lights restaurant, leaving in place the town’s right to accept it in the future. Town Council Chairman James Garvin raises his hand to vote on a motion during Monday night’s meeting on paper streets. The Conservation Committee has identified Surf Side Avenue and Atlantic Place as potential trails in the town’s 2013 Greenbelt Plan, but it has no plans to install a trail there at this time. The committee hasn’t recommended that a trail be constructed at Lighthouse Point Road, but it does support the preservation of the town’s rights to the paper streets. The general public currently doesn’t have the legal right to be on the paper streets, but residents of the subdivision do, either stated or implied in their deeds. Residents packed the council chamber Monday night and testified for more than an hour. 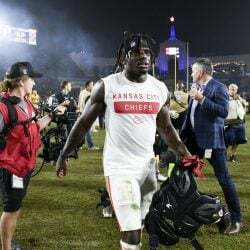 Several urged the council to delay its vote. “For some unknown reason, you are rushing a vote and rushing very fast to vacate these shoreline access points,” said Connie Pacillo of Reef Road. Mary Ann Lynch, a former town councilor, was one of several townspeople who said vacating the paper streets would be giving up valuable public waterfront access. Andrew Ingalls speaks in favor of having the town vacate paper streets along two shoreline areas. He told the council that it shouldn’t accept the paper streets and allow the public to stroll by the waterfront homes. Lynch also said Monday’s meeting violated the town charter and that any votes taken during it could be challenged because the council voted during its Oct. 30 workshop to reschedule the meeting from Nov. 13 to Nov. 6. Voting during workshops is allowed only in special circumstances. 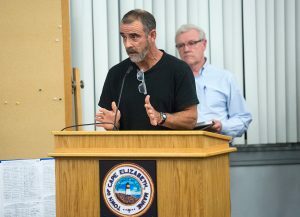 Other residents said it would be absurd and destructive to accept the paper streets and allow the public to stroll by the waterfront homes on Surf Side Avenue.